Which Dogs Get Along with Pugs? Pug owners looking for a second dog have an advantage because pugs are a breed that gets along well with most animals. According to the pug breed standard of the American Kennel Club, pugs are even-tempered and outgoing in nature. However, certain breeds make more suitable companions for this popular breed. One of the strongest personality traits of the pug is its devotion to humans. 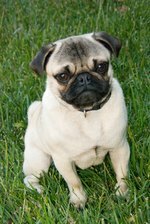 According to Pug Rescue of Sacramento, pugs are very focused on their owners and are often referred to as your "shadow." By having two pugs, both dogs will enjoy being your companion without becoming bored with each other. It is less likely that one dog will pester the other to play constantly, unless you are involved and then all three of you can enjoy some time together. The pug's friendly nature is best paired with other stable, happy-go-lucky breeds such as poodles, Havanese, Maltese, beagles, Labrador retrievers and several others. Two happy dogs are likely to get along and enjoy each other's company. Certain breeds known to be more reserved may have personality conflicts with the pug. The pug's trusting nature may not pair as well with the protective nature of the Chihuahua and the egotistical side of the Pekingese, for example. Pugs act as if they are large dogs, but they are somewhat fragile due to their unique physical characteristics. The AKC describes pugs as susceptible to genetic problems such as luxating patellas or "trick knees," protruding eyeballs and breathing problems. A larger dog may try to play with the pug, which averages 20 pounds, and inflict unintended injuries simply due to the size difference. A smaller dog has less of a chance of accidentally harming its pug companion during playtime. Some dog breeds, such as the German Shorthaired Pointer, have boundless strength and need to run outside for an hour each day to burn off their excess energy. While pugs are excitable, energetic dogs, they are limited in exercise ability by their short nose and compact face. Running or playing, especially in warm weather, is dangerous for pugs if overdone because their respiratory system is limited by the facial structure, according to the American Veterinary Medical Association. Pugs will quickly overheat and suffer from a lack of oxygen if prompted to exert themselves too much, perhaps by a high-stamina dog sibling. A dog with a similar exercise tolerance level makes a better companion, such as a Basset Hound.